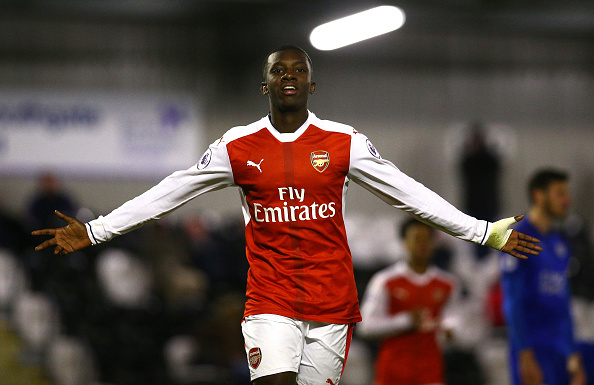 English-born Ghanaian teen striker Edward Nketiah underlined his sensational scoring form by netting for Arsenal U23 in their 1-1 draw with Swiss side FC Basel in the UEFA Youth League on Tuesday night. The 17-year-old scored in the 80th minute to open the scoring at Leichtathletik Stadion St Jakob but the hosts equalised at the dying embers of the game. Tuesday night’s goal means the prodigious striker has scored 5 goals in his last four games for the young gunners. Nketiah is a member of Kwame Ampadu’s U18 Arsenal side but his enormous precocity has earned him regular starting role in the U23 side and he’s been scoring for fun. After netting a hat-trick last week against Leicester City in a U23 game, he went ahead to score for the U18s in their 2-2 draw with Chelsea in the weekend. While scoring and playing full throttle on Tuesday night, his Ghanaian compatriot Jordi Osei-Tutu was watching the entire action from the bench. The youngster has bagged 10 league goals for the U18 side and scored four times for the U23s. Nketiah was born to Ghanaian parents in the United Kingdom and has shown great promise with Arsenal. He is eligible to represent Ghana if the West African giants show interest in capping him.